SunRa100 @ House Of St Barnabas was a challenging and thrilling session that dug into the archives of flautist Rowland Sutherland to revive a set of charts that were written for event which took place back in 1999 and featured amongst other Detroit’s Carl Craig and the Innerzone Orchestra drummer Francisco Mora. 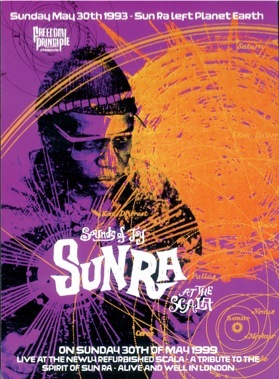 OK… so, back in 1999 broadcaster and producer Lyn Champion organised a tribute to the late Sun Ra at the Scala in Kings Cross. Rowland Sutherland did the scores and the band – the London Art Collective – included Orphy Robinson, Pat Thomas, an excellent horn player whose name currently evades me, Detroit techno don Carl Craig and former Arkestra and Innerzone Orchestra drummer Francisco Mora. The Light Surgeons did the visuals and Swifty did the poster. It was a bold venture and wild session but, for Lyn, it was a financial disaster. A hard lesson was learned. As she says, “I should have had my own person on the door. Not the Scala’s.” She left the building that night financially devastated, threw the film footage and the recording a box and they’ve pretty much remained there ever since. However, while working with Rowland on the ‘Enlightenment- A Love Supreme’ project I asked whether to the charts he’d done for that gig still existed. Apparently some did and some didn’t. Pat Thomas’ charts which were left on the piano after sound check vanished before the gig – luckily Pat has a photographic memory. 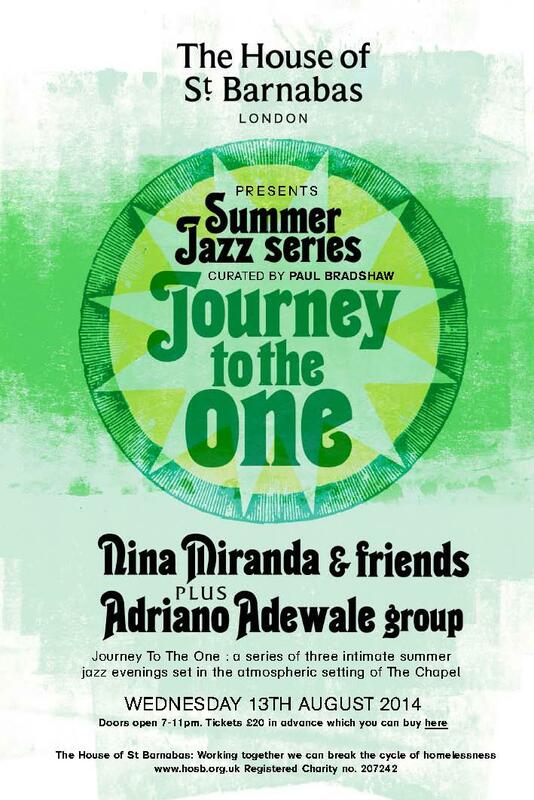 As I was also programming Journey To The One – a summer jazz series at The House Of St Barnabas – we decided to revive the charts that existed and air several of them at Meltdown prior to the Enlightenment set. They sounded good… very good. 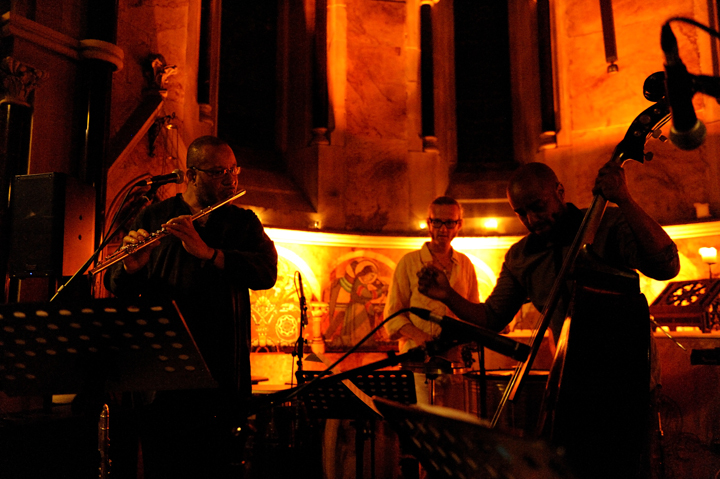 A follow up performance in the Chapel at the HOSB was a must and the London Art Collective was reborn. At the House Of St Barnabas, the London Art Collective, consisted Rowland, Orphy, Pat, Neil Charles, Rachel Musson and Maurizio Ravalico. Some basic charts that Orphy and Pat had were added to the mix along with Joe Henderson’s ‘Earth’. The result was two 45 minute sets that combined structure and improvisation and allowed us shine new light on a set of Sun Ra classics like ‘Strange Celestial Roads’, ‘Friendly Galaxy’ and ‘Ancient Aiethopia’. 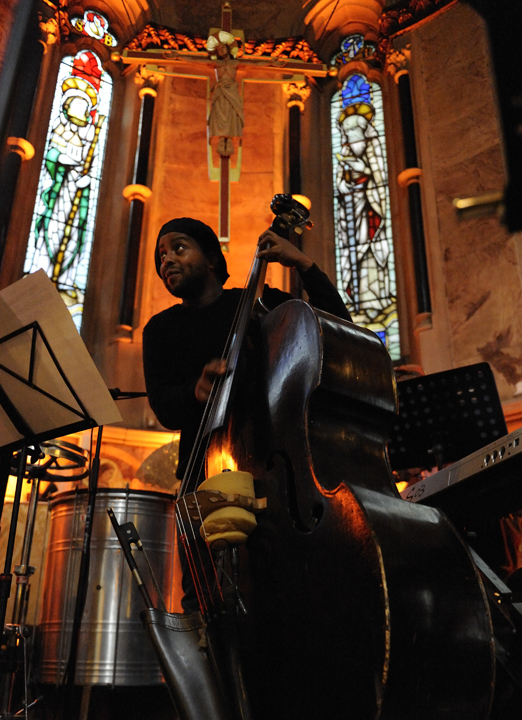 The drummer-less ensemble was propelled along by bassist Neil Charles who’d flown back from the dark side of Moscow after playing a “festival” with Theo Parrish. He was ably supplemented by percussionist Maurizio Ravalico who’s surdo drum added power to the rhythms and who’s congas gave the ensemble an early Black Arthur Blythe feel. 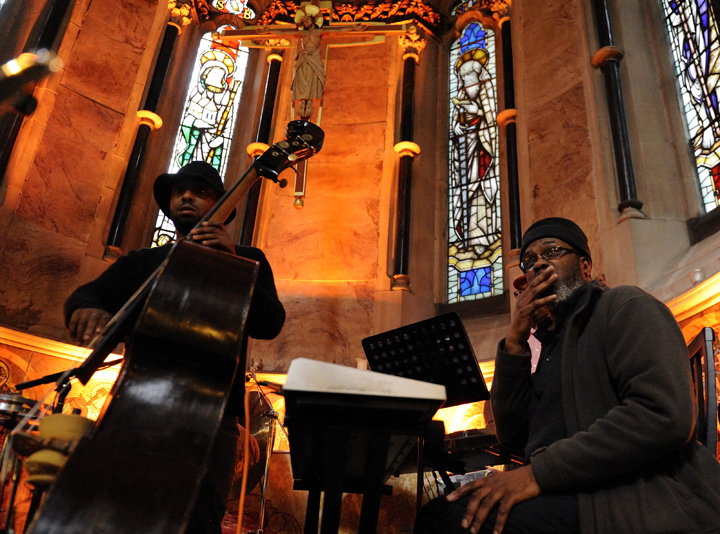 In the midst of the ensemble was the heavyweight Black Top duo of Orphy Robinson on xylosynth and electronix whizz Pat Thomas who has spent decades osmosing the music of Ra and his Arkestra. The only non Sun Ra composition in the mix was an extended groove based rendition of Joe Henderson’s ‘Earth’ and fine it was too. 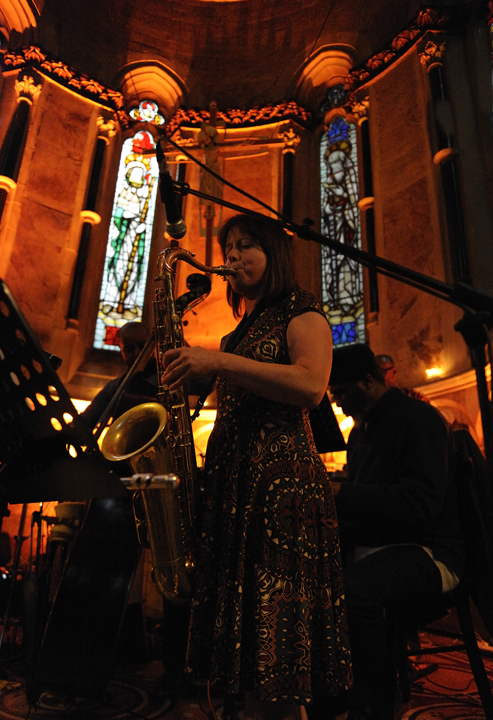 The rapport between Rowland – love that bass flute – and fellow flautist Rachel Musson developed as the night progressed but it was Rachel’s forays on tenor sax that blew the audience away. Only a couple of weeks before the SunRa100 in The Chapel I’d been thrilled by Marshall Allen and the Arkestra at Cafe Oto but I can honestly testify that the arrangements and playing of the London Art Collective provided a perfect companion set. It was true to Sun Ra’s rigorous approach. It was innovative, energising and made this listener want to compare what I’d heard in The Chapel to Ra’s original versions. I wanted to hear more. 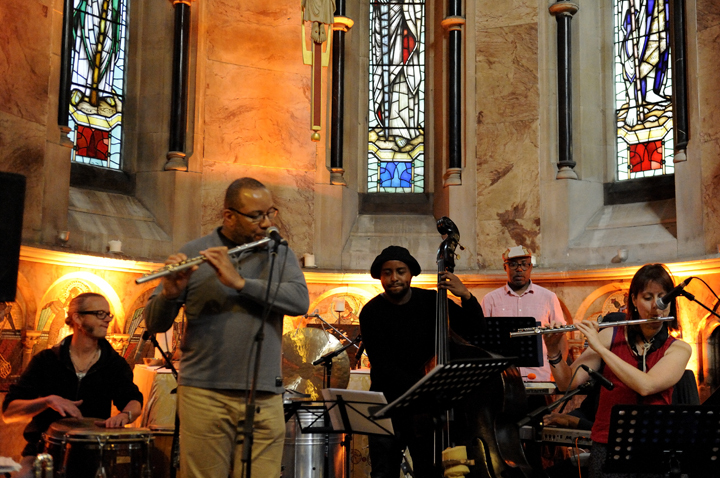 Watch out for more live sessions from the London Art Collective with SunRa100. 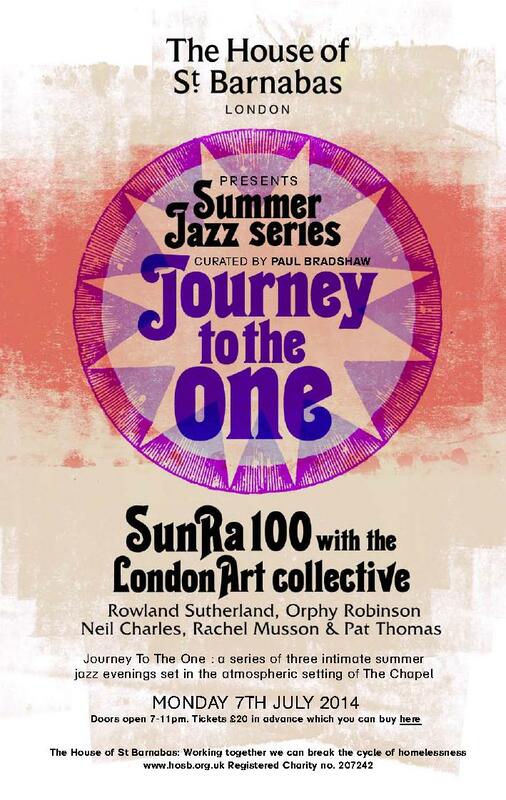 The follow up to SunRa100 takes place this Wednesday 13th August at The House Of St Barnabas. It’s on a Brasil- London – Senegal – Ghana tip and features Nina Miranda’s Supabanda + the Adrian Adewale Group.Don’t sleep on this. This entry was posted in Is That Jazz?, Words, Sound & Power and tagged 'Enlightenment- A Love Supreme', Afro Futurism, Black Top, Cafe Oto, House Of St Barnabas, Jazz, Marshall Allen, Rowland Sutherland, Sun Ra, Sun ra Arkestra. Bookmark the permalink.